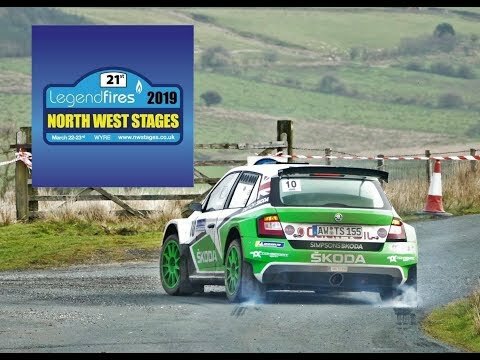 After holding a 1 second lead with two stages to go, the Simpsons SKODA Fabia R5 looked all set for it's first outright win in the UK at the Legend Fires North West Stages Rally. Pushing to the max to maintain this slender lead, Neil and Mike made a small mistake on the penultimate stage which resulted in a half spin, costing them 7 or 8 seconds and dropping them to 3rd. Despite a heroic effort on the final Weeton stage with another fastest stage time it was not quite enough to regain the lead. Neil and Mike finished on exactly the same time as 2nd place Alex Laffey but would eventually be placed 3rd overall, as Alex had set a quicker time on the event's opening stage. So a slightly disappointing end to a simply great event. We'd like to give our thanks to the event organisers, Myerscough College & University Centre, the great guys from Toksport WRT for another perfectly prepared car, Garstang Town Council for their incredible generosity and the huge army of volunteers that made this event so special.